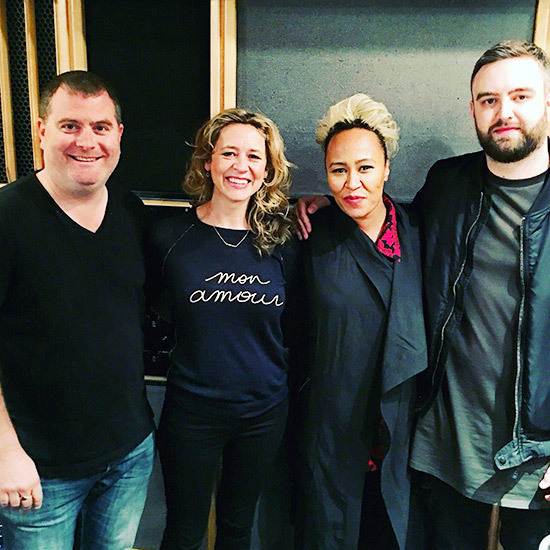 Back in April Rosie Danvers went back into the studio with the fabulous Emeli Sande after a four year break. One of those songs was ‘HURTS’, Emeli’s first single to be released in 4 years!! Strings Arranged by Rosie Danvers, Performed by Wired Strings, String session Produced by TommyD, Engineered by Jake Jackson and Recorded at Air Lindhurst, April 2016. Metro - 'Strings Soar and a Gospel Choir takes us to Heaven’. Photo: TommyD, Rosie Danvers, Emeli Sande and Chris Loco at Air Lindhurst, London, April 2016.